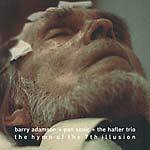 Pan Sonic, arranged and edited by Barry Adamson, with an additional re-arrangement by The Hafler Trio. Here, Barry Adamson and Pan Sonic have composed a 12-minute music piece that is performed by the Hljomeyki Choir and Pan Sonic. Originally released on CD by Icelandic label Kitchen Motors in 2001, now released on vinyl for the first time by Cold Spring. Produced by Barry Adamson, Jóhann Jóhannsson, and Pan Sonic. The cover art features Icelandic electronic composer Magnús Blöndal Jóhannsson having a brain scan performed while listening to this disc. 180 gram vinyl with matte card sleeve; Includes download card. "...a blend of an Icelandic choir performing Barry's (treated) microtonal, urgent score is slowly infiltrated, first with an electronic breath and then by well-rounded bass that evolves into a satisfactory crescendo before the scary humhum returns... highly successful" --Vital Weekly.